Get Rid of Pests for up to 3500 sq Feet! -Small animals like raccoons, skunks, squirrels and chipmunks. -Spiders, fleas, ticks and other flying crawling insects. Almost every pest is effected by this unit. We've found no other unit that repells as many pests as this one single device. For under $100, you won't find better, more effective coverage in any other product. Set it to the desired pest control setting. The Transonic Pro Pest Repeller is unique in its design. It uses "Psychoacoustic Jamming" Electronic technology to keep an area free of pests. The Transonic's Intense, variable pitch ultrasonic and sonic sound waves effectively repel pests. This noisy, hostile, dynamic sound environment is intolerable to pests, yet friendly to pets, humans and the environment. The Transonic Pro has 9 Different Settings: User-friendly controls let you choose frequency/volume and sound pattern. 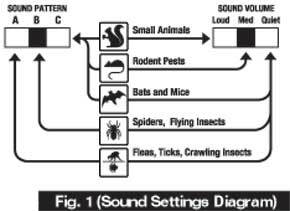 Ultrasonic for most indoor pests; sonic (audible) for most outdoor pests. NOTE: While this unit is extremely effective, we do not recommend using it inside a home around people. This unit is audible to humans, even on the ultrasonic settings, and if you plan on being around the unit, it will be uncomfortable. We recommend this unit out in a garage, a barn, or up in an attic space, where people won't be directly exposed to the noise. If you're looking for something absolutely inaudible to humans, we recommend the equally effective Attack Wave Pest Repeller. The Attack Wave is perfect for the indoor environment. To go to the Attack Wave Click Here. The Transonic Pro Pest Repeller has proven to be effective in Food establishments, farms, garages, basements, attics and crawl spaces, barns, roof eaves and awnings, warehouses, commercial facilities, porches, pool areas, campsites and more. Less expensive, less dangerous than perpetual chemical use. Coverage: To 2000 square feet depending on environment. I recently purchased the Transonic Pro to repell a serious rat problem. They simply would continue to chew their way in no matter what I did. I am happy to say that your product works fantastic!! Not one rat has come back. I turn the unit on at night when I leave, because that is when the rats would come back. I use the highest setting because no one is at the shop so there is no one but the rats to bother. It works very effectively, if used correctly. I live on Vancouver Island where we typically have lots of rats, so it is great to find a product that really delivers. Thanks so much!